Lindsey Pulliam takes a mid-range jumper against Rutgers. The Cats will face off against Rutgers on Dec. 28 to open their Big Ten slate. With the announcement of the conference schedule Tuesday, Northwestern’s complete 2018-19 schedule has been released. The Wildcats open the Big Ten slate with a Dec. 28 matchup in Piscataway, New Jersey against Rutgers. NU plays its first home conference game three days later with a New Year’s Eve game against rival Illinois. One stretch from the end of January to the middle of February sees the Cats playing five of six games against teams who reached the 2018 NCAA Tournament. Only two of those contests — versus Minnesota and defending conference champion Ohio State — will be played at Welsh Ryan Arena. 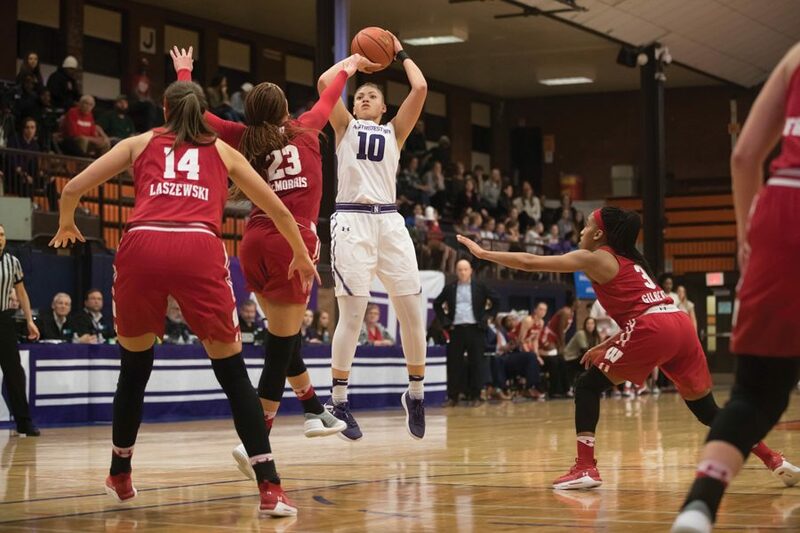 The one non-tournament team NU will play is Illinois, who the Cats beat twice last season. NU’s final home game of the season will be on Feb. 26 against Indiana before playing its regular season finale in Iowa City against Iowa. The Cats play Indiana, Illinois, Minnesota, Nebraska and Purdue twice during the season. For the fourth-straight season, the Big Ten tournament will be held in Indianapolis. In each of the three previous seasons, NU has won at least one game in the conference tournament. The team’s non-conference schedule had previously been announced earlier this month. The Cats have 11 non-conference games scheduled plus a preseason exhibition against Lewis on Nov. 4 in Evanston. NU opens the season with an away matchup against Green Bay before having its home opener against Duke on Nov. 11. Three of its non-conference games will be played on the road. In addition to travelling to Green Bay, the Cats will make a trip into Chicago to play at DePaul and fly to Gainesville, Florida to take on Florida. As part of the Big Ten/ACC Challenge, Pittsburgh will travel to Evanston on Nov. 29 for a matchup with NU. The Cats end their non-conference slate with two games in Las Vegas at the Duel in the Desert tournament during winter break.